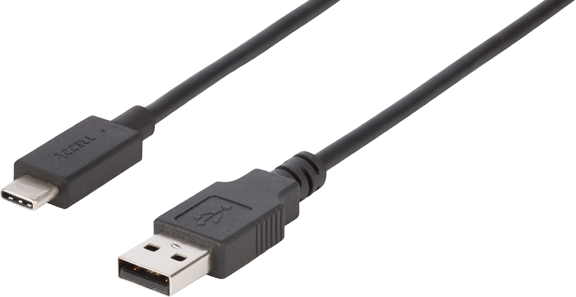 The Accell USB-A to C USB 2.0 Cable with charging allows you to easily connect your USB-A host computer to a USB-C (also known as Type-C) device. With a reversible USB-C connector the cable connection works in either direction. Able to charge, transfer data to and power a connected device, the USB-A to C cable with ultra-compact connectors is incredibly powerful. USB 2.0 compliant, this cable can transfer data at speeds of up to 480Mbps. Supporting up to 3A charging output, the USB 2.0 cable can transmit up to 60W of power, ideal for safely charging or powering USB-C devices. Please note: This cable works with the USB-A side connected to the host (computer). This cable does not support the USB-C side connected to the host.